Cuyuna Lakes Area is Minnesota’s newest bike destination. Formed by lakes and some old iron ore mines of days gone by, it is a place for bicyclists of every skill level to enjoy. 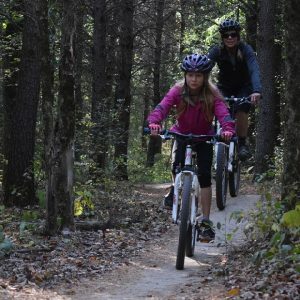 In exploring Cuyuna, you can enjoy riding through forests, by lake shores, and along side of mountains made from the rocks that were taken from the old pits. In these three connecting towns, where the Cuyuna Range stretches, it is easy for you to park your car and explore the communities by bike. With miles of trail, plenty of retail for recreational and restaurant choices, it’s easy to spend several days here. Here you will find one of the newest mountain bike parks, certified by the International Mountain Bike Association (IMBA). With miles of well marked trails for all levels of riders, one can enter the trail either from Ironton or Crosby. In Downtown Ironton, the trail users will find restaurants and many services. The access is away from highway traffic making this a safe connection for trail users. In Crosby, the trail passes adjacent to the Croft Mine Historical Park on the city’s paved trail. 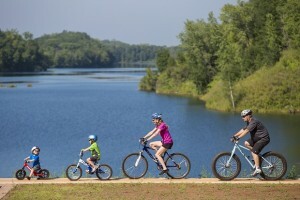 For the recreational and road touring riders, enjoy the five-mile Cuyuna Lakes State Trail and the many low traffic roads that create some wonderful loops that will take you along the Mississippi River and lakes in the area while riding here. 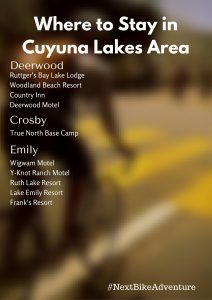 From the Dairy Queen in Crosby to lakeside dining at Ruttger’s Bay Lake Lodge, the Cuyuna Lakes Area offers several interesting and charming cafes, coffee, and ice cream shops ideally suited to a cyclist’s taste. Along with most hotels, many coffee shops and restaurants have Wi-Fi availability. Additionally, the public library is another good option. Jessie F. Hallett Memorial Library is located at 101 1st St. S.E., Crosby, MN 56441 and can be contacted by phone by dialing 218-546-8005. See the Cuyuna Lakes Tourism Bureau for more detailed information. This entry was posted on June 10, 2016 by Russ Lowthian. The area of Leech Lake is still the land of stories, rich history, and is a great place to bike. As more and more people discover this beautiful area, where the Heartland Trail intersects with the Paul Bunyan Trail, there are adventures that are sure to turn into a tale that can be shared over and over. Whatever you seek, come to the Leech Lake Area and form your own tale. A fun place to mountain bike with warmer days ahead is the Godbolt Lake and Hanson Lake Loops, near Walker, MN, just south of Leech Lake. The Heartland State Trail is a multiple-use paved trail between Park Rapids and Cass Lake, with Walker at the center, intersecting with the Paul Bunyan Trail. The trail is located entirely on a level abandoned railroad grade, except a segment of the Paul Bunyan Trail southwest of Walker is on sharply rolling terrain. The 22 mile segment to Cass Lake, north of Walker, offers views of lakes, rivers, and streams and many are accessible from the trail. This trail corridor passes through northern hardwood forests, stands of jack, red pine, white pine, as well as the spruce fir forests for scenic views of nature along the way. The Paul Bunyan Trail, stretching from Bemidji to Brainerd, intersects with the Heartland Trail in Walker. Built along abandoned rail corridors, both these trails are great venues for easy-going exploration of northern Minnesota. Mountain bikers will appreciate both the Gadbolt Lake Loop and the Hanson Lake loop in the area. From the Lucky Moose Bar & Grill to the elegant Dancing Fire Restaurant, the Leech Lake/Walker Area also offers several interesting and charming cafes, coffee shops, and ice cream shops ideally suited to a cyclist’s taste. Along with most hotels, coffee shops and restaurants have Wi-Fi available. Additionally, the public library is another good option. The Walker Public Library is located at 207 4th St., Walker, MN and can be contacted at 218-547-1019. See Leech Lake Tourism for more detailed information for exploring Walker, Minnesota. Akeley is located on the Heartland Trail. Here in town, you can enjoy the Paul Bunyan Historical Museum, the Akeley City Park & Campground, and the Moon Dance Ranch & Adventure Park. This is a great place for family fun all day. Situated at the heart of Minnesota’s “ten thousand lakes,” south of Walker, Hackensack is home to the ultimate in fishing, water-skiing, swimming, and canoeing. In fact, you’ll find 127 lakes within a ten mile radius of here. This community along the trail offers several interesting and charming coffee shops and cafés ideally suited to a cyclist’s interest. The gateway to the headwaters of the Mississippi River begins at Park Rapids. With five state forests surrounding this community, there is something for everyone in the Park Rapids area. 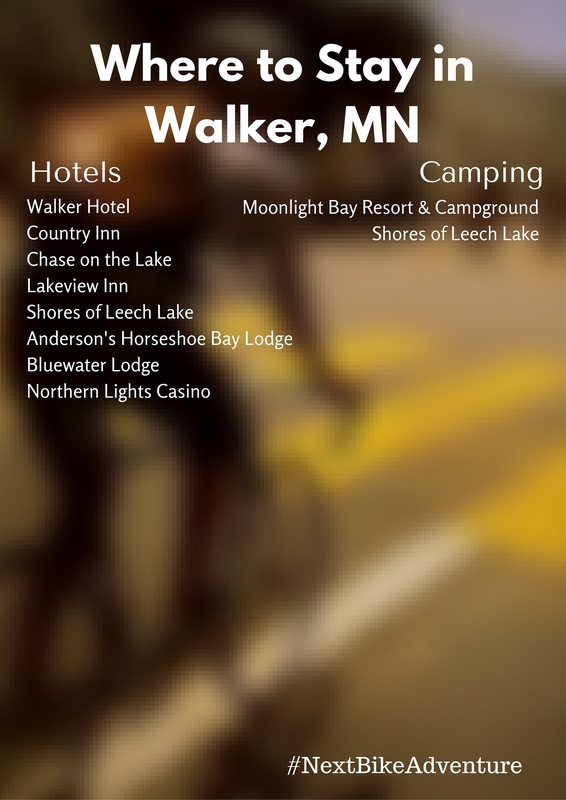 You can ride the scenic roads and trails around the many lakes for a true north wood’s experience. Lakes, loons, and legends will help you explore the paved Heartland Trail. The trail starts in Park Rapids and will take you east, passing through several charming towns for treats and unique attractions before connecting to the Paul Bunyan Trail. A biker on a fat bike riding a single track mountain bike trail. Enjoy the beauty of the lakes and forests around the Park Rapids area. From the park next to Fish Hook River, the Heartland Trail is an easy way to see the countryside as the trail passes several quaint towns along the way. The town of Dorset is just 14 miles away and is known as the “Restaurant Capital of the World.” Here, the streets are lined with shops and many restaurants serving the perfect meal. For the mountain bikers, there are miles of varying terrain in the Paul Bunyan State Forest and Itasca State Park. The Heartland State Trail is a paved trail between Park Rapids and Cass Lake. The trail is located entirely on a level abandoned railroad grade, except for a segment southwest of Walker which is located on sharply rolling terrain. The 22 mile segment to Cass Lake, north of Walker, was paved in 2002. There are numerous views of lakes, rivers, and streams, many of which are accessible from the trail. The trail passes through northern hardwood forests and stands of jack, red, and white pine, as well as spruce fir forests. Headwaters 100 occurs annually on September 24th. From the deli at the 3rd Street Market to the elegant Necce’s Ristorante, the Park Rapids Area also offers several interesting and charming cafes, coffee, and ice cream shops suited to your taste. When exploring Park Rapids, check out these places for lodging. Along with most hotels, coffee shops and restaurants having Wi-Fi availability, the public library is another good option. The Park Rapids Public Library is located at 210 1st St. W., Park Rapids, MN 56470 and can be reached by 218-732-4966. See Park Rapids Tourism for more detailed information. There’s a reason why thousands of people visit Dorset, Minnesota each year. The décor of the “Restaurant Capital of the World” is small-town friendly. The streets are lined with boardwalks, casual porch swings, and flower baskets. The shops are filled with special items from artistically-crafted pottery and lamps to unique décor and antiques that turn houses into homes. Whether casual or formal, the restaurants serve the perfect meal around tables for happy friends and families. This makes a trip to Dorset a must-do event. Nevis has been a vacation destination since anglers discovered that the area’s lakes were filled with cool, clear water and lots of fish. Hikers and campers have more than 40,000 acres of the Paul Bunyan State Forest to explore on foot or by bike. This entry was posted on June 6, 2016 by Russ Lowthian. Bemidji is the first city on the Mississippi and is a Bike Friendly Community located on the south shoreline of Lake Bemidji. At the Visitor Center, the famous statues of Paul Bunyan and Babe the blue ox will greet you to the area. 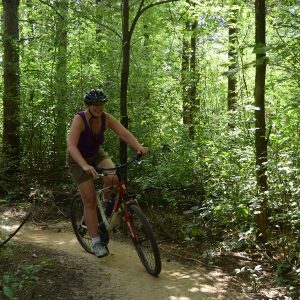 Visiting this bronze level bike friendly community, you will find many scenic county roads and miles of paved trails for touring. 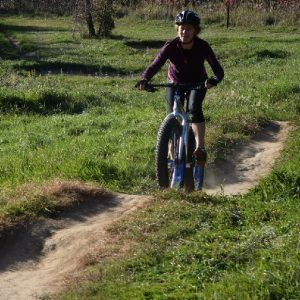 For the more adventurous folk who look forward to exploring Bemidji with some adrenaline, there are mountain bike parks for off road fun! Explore Bemidji and enjoy the beauty of the lakes and forests around the area. From Lake Bemidji State Park, the Paul Bunyan Trail passes through the area on the north end of the lake. The trail is a part of a 110 mile paved rail-bed route that leads south into Crow Wing County. For road riding, choose from many scenic loops. You can follow sections of the Mississippi River Trail and parts of the Chippewa National Forest. For mountain bikers, there are miles of varying terrains both through state forests and on old logging roads in the Chippewa National Forest. If you’re looking for more challenging terrain, check out parks like Movil Maze. From the deli at Lueken’s Grocery to the elegant Turtle River Chop House, the area also offers several interesting and charming cafes. Additionally, there are great coffee and ice cream shops. When exploring Bemidji, you want to ensure that you have a great place to rest after all that adventuring. Along with most hotels, many coffee shops and restaurants have Wi-Fi available. The public library is also good option. The Bemidji Public Library is located at 509 America Ave. N.W., Bemidji, MN 56601 and can be reached by phone at this number: 218-751-3963. See the Bemidji Tourism Bureau for more detailed information. Where the Mississippi River pauses, native inhabitants and settlers alike found the location to be a great place meet and explore. In the center of Little Falls, at Maple Island Park next to the fall on the Mississippi River, you will have a better idea how the town received its name. With the Soo State Trail crossing the river below the city and the Paul Bunyan Trail soon connecting from the north, you will find miles of scenic, bike-friendly roads for your riding pleasure. With plenty of retail, recreation, and restaurant choices to explore, it’s easy to spend several days here. Touring cyclists on the Mississippi River Trail (MRT) just north of Little Falls, MN near Camp Ripley. Explore and enjoy the beauty in one of the oldest river towns in Minnesota. From most hotels in town or the Charles A. Lindbergh Sate Park campground, it is easy to ride your bike to connect to the paved trail and quiet roads for miles of enjoyable bicycling. North on the Mississippi River Trail, ride up to Camp Ripley where the Veterans State Trail will soon connect to the Paul Bunyan Trail. South on the Mississippi River Trail, make an easy “Round-the-river-loop” crossing on the Soo Trail Bridge and ride back up on a quiet road on the river’s east bank – or venture to the southwest on the Soo Trail to the Lake Wobegon Trail. For more road riding options check with the local bike club for your riding pleasure. For the mountain biker, there are miles of varying terrain through back country roads and the Soo Recreational Trial running east to the state border. From the Corborn’s Deli to an elegant meal at The Black & White, the Little Falls area also offers several interesting and charming cafes and ice cream shops suited for your taste. Great places to stay while exploring Little Falls. Along with most hotels, coffee shops and restaurants have Wi-Fi availability. The public library is another good option. Find the Great River – Little Falls Public Library at 108 N.E. 3rd St., Little Falls. They are also reachable by telephone at 320-632-9676. See the Little Falls Tourism Bureau for more detailed information. This entry was posted on June 3, 2016 by Russ Lowthian. With the main trailhead for the Paul Bunyan State Trail located here, the Brainerd Lakes Area boasts more than 465 lakes clustered next to scenic forests. Additionally, it has a series of bike-friendly roads to explore. Leading into town, both the Paul Bunyan and City Trails allow you to explore all Brainerd has to offer by bike. With plenty of retail, recreation, and restaurant choices to checkout, it is easy to spend several days here while exploring Brainerd. mountain bike team is creating some fun memories in the Pillsbury State Forest near Brainerd, MN. Explore and enjoy the beauty of the lakes and forests in and around the Brainerd area. From most hotels in town it is easy to ride your bike to the Paul Bunyan Trail and connect to the paved lake community roads for miles of enjoyable bicycling. From the Arboretum, the Paul Bunyan Trail takes you on a 110 mile journey on the paved rail-bed up through Pequot Lakes, Pine River, Hackensack, Walker, and then to Bemidji. For road riding explorers, choose from many scenic loops designed by the local bike club for your riding pleasure. For the mountain bikers, there are miles of varying terrain through state forests and the newly formed Cuyuna Recreational Area. For other fun activities in the area such as fishing, golf, or others, check out more at Brainerd’s Activities Page. From the Coco Moon Coffee Barto, an elegant lakeside restaurant, to Ivens On The Bay, Brainerd also offers several interesting and charming cafes and ice cream shops. When exploring Brainerd, stay well-rested to keep the memories going by staying in one of the great camp grounds or hotels Brainerd offers. Along with most hotels, many coffee shops and restaurants have Wi-Fi available. The public library is also good option. The Brainerd’s Public Library is located at 416 S. 5th St., Brainerd, MN 56401 and can be called at the following number: 218-829-5574. See the Brainerd/Baxter Tourism Bureau for more detailed information. This entry was posted on June 1, 2016 by Russ Lowthian.